Who is Mr. Denkmeier, anyway? What's coming next down the 3D astronomy product pipeline. Scroll down to read the complete profile of Russ Lederman. Fig. 1 - Russell Lederman of Denkmeier Optical and 3D Astronomy. 1. How long have you been involved with astronomy, and what inspired you to get into this field? In my early years as a child in Brooklyn, I can recall being fascinated while looking up into the night sky. I remember seeing what I thought looked like a small group of stars that I learned much later was M45, The Pleiades. I also heard that a boy down the block had a telescope that "could show the rings of Saturn". When I heard that, my imagination went wild! For me, the idea that I could peer into an eyepiece attached to a telescope and see Saturn and its rings made me yearn to possess such an instrument. While I never did get to see that telescope, just the idea of having something like that fueled a rather intense desire in me that would resurface many years later. 2. So you didn't get your first telescope as a kid? No! Fast forward to me as a 25-year-old in Maryland (I'm 60 now). That's when I finally decided to get an inexpensive telescope. My interest in the night sky re-emerged after coming down with the flu and asking a friend to bring me a library book on astronomy. After reading sections of The Larousse Encyclopedia of Astronomy (Prometheus Press, 1959) and learning more about galactic and extra-galactic objects, I knew that I had to see these exotic works of natural art for myself. That book had amazing images from photographic plates taken at the Mt. Wilson Observatory with the 60" and 100" telescopes. I couldn't decide what I was more enamored with, M42, the Orion Nebula in our own galaxy, or M31, the "Great Nebula" in Andromeda, which we now know is a galaxy some 2 million light years away. In any case, these were the two deep-sky objects I had to see first. I was living in a small mobile home in a rural area, so I had very dark skies. My very basic "department store" 60mm refractor equipped with a rather narrow-field eyepiece managed to bring the light from M42 to my eye. I couldn't believe I was actually seeing it in real time! I can still remember it looked like an electrical storm glowing far in the distance. Using a basic sky map, I star-hopped to the area where M31 should be. After some searching, I found the glow of the galaxy and, again, I was just thrilled that I was seeing the light from something over two million light years distant. 3. After that first experience, it was time to get serious? After that night under the stars, I knew the time had come for me to get a "serious" telescope! My girlfriend (now my wife of 25 years) attended what's now Salisbury University, and I would spend hours in the school's library looking at the ads in Sky & Telescope. Do I get a Coulter big Dobsonian, or an SCT? My tergiversation in this matter delayed my decision for many months. I finally decided on the SCT and purchased a 10" Meade LX3. I immersed myself in subject of observing the deep sky and planets. I lived in a two-story walkup and would carry my scope and equipment down those stairs, load them in my pickup truck and drive, all alone, out to the darkest skies that I could find in the Pocomoke Forest. I remember wearing boots and standing in shin-deep snow when I saw M46 and the planetary NGC 2438, the mind boggling and mighty M13, and "discovered" a comet" which actually turned out to be Mirach's Ghost, NGC 404! I can still close my eyes and remember how they looked and the way I felt while seeing these incredible objects for the first time. Fig. 2 - Denkmeier Binotron-27 binoviewers. 4. Then did you get a case of "aperture fever"? After three years of working with the 10" SCT and gaining knowledge about the night sky, eyepieces, and optics, it was time to take the next step. At an informal gathering of the Delmarva Star Gazers, I had the opportunity to view the Crab Nebula with a 20" Obsession Dobsonian. "OMG", or whatever else one would not have said in the days before the internet, is how I'd describe my reaction in hindsight. The next week, I sold my SCT locally and ordered a 20" f/5 mirror from the late, great John Hall at Pegasus Optics. I built my own Dob while awaiting the mirror and finally, almost one year later, I was ready for first light. How did I like the views? So much that this is still my main telescope some 23 year later! Back in those days, f/5 was typical, and "fast" was f/4.5. Nowadays, the amazing skill of several mirror makers allows ratios like f/4, f/3.75, f/3.3 and faster! Fortunately, I located my Maryland 3D Astronomy optical lab at a very dark site and I have only to roll out the big scope from a garage to start observing. Collimation and 'Sky Commander' alignment takes five minutes and I am ready to observe the heavens in beautiful 3D! 5. Many know you from your work with binoviewers at Denkmeier. What motivated you to get into developing products for 'two-eyed' observing? I remember being very interested in the prospect of using two eyes with my telescope. A friend and I started buying microscope heads and converting them for use in astronomical telescopes. In those early days, we used Barlows to allow focus in the big Dobs. It was soon apparent that even when using 40mm Plossls, the magnification created by the telenegative lens was very high. I calculated that a typical 2X Barlow created approximately 3.5X so that if a 40mm single eyepiece in 'native mode' produced 62.5X in my 20" f/5 scope, then using the Barlow and the microscope head I'd get a minimum magnification of 219X. A 40mm Plossl only has an apparent field-of-view of 42 degrees. So clearly, any deep sky pursuits would be strictly limited to very small and bright objects. 6. Which is a big restriction of course. Most people want to have much wider, low-power fields of view with binoviewers, at least for some objects. That's right. So I started working on creating the lowest-magnification optical system that was possible in the hopes of allowing better deep-sky views with a binoviewer. At the same time, also I searched for the very best and largest-aperture microscope head I could find. After making many calls, I found a company located in the USA who had microscopes produced for them. They told me that their scope head had 26mm-aperture prisms. It proved to be far superior to anything else I could find. So we altered the interior of the unit to open up the aperture and machined 1.25" eyepiece holders and other mechanical parts required for telescope use. I continued to field test optical combinations and custom components until I was finally able to produce a rather low magnification factor. I filed for an S2 Corporation and "Denkmeier Optical" was founded in 2001. There was never any person named Denkmeier involved in the company. My father-in-law recommended the name and it was very close in sound to my friend's last name. So we went with it. Fig. 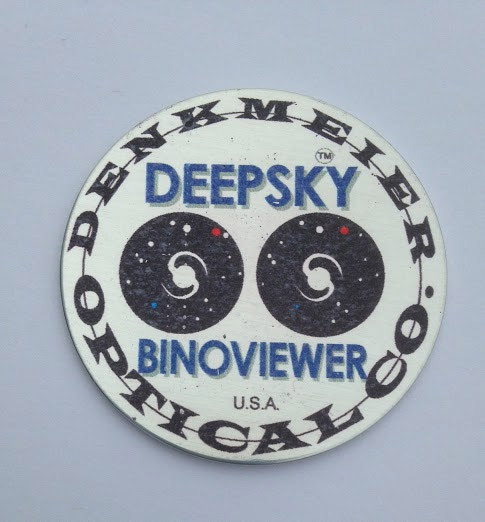 3 - The original '3D' logo for Denkmeier's first binoviewers. 7. How did the "Power Switch" technology in your binoviewers come about? I had become very familiar with binoviewers and my compound OCS (Optical Corrector Systems). One day I had that "eureka moment" where I imagined an efficient way of toggling out the optic closest to the binoviewer. If I moved the positive lens that drove down the magnification created by the negative lens via a switching mechanism, the observer could view at two instantly accessible powers with one pair of eyepieces! Furthermore, if a second negative lens or a second positive lens on the opposite side could also be introduced or withdrawn, three magnifications could be implemented instantly, again with one pair of eyepieces. I filed for a patent and the Power Switch became a very important and unique feature of Denkmeier Binoviewers. This was my first major innovation in the amateur astronomy field. I was very excited and pleased. Many observers told me they enjoyed using the binoviewer and easily seeing objects at three powers without having to touch the eyepiece pair in the binoviewer. This feature was expanded to include what is now called the Filter Switch and the Power Switch Star Diagonals for both binoviewer and single-eyepiece use. Even for single eyepiece users, the S1 ("S" for SCT and "1" for single eyepiece users) allows those using a SCT to switch between normal, 2X magnification, and .66X reduction. We still manufacture all of these systems and have sold them in over 50 countries worldwide. Denkmeier Optical headquarters are located in the Spectrum Thin Films facility on Hauppauge, Long Island, New York. Spectrum Thin Films Founder Tony Pirera is President and co-owner. We joined forces in 2008 and now I travel to New York frequently to build, collimate, and oversee production of the Denkmeier line of products including the Binotron-27. I should mention that with all I learned working with microscope heads, my dream was to create a binoviewer from the ground up with all of the features I felt were most important. The Binotron-27 represents this effort. Users can easily collimate the Binotron-27 if ever the need arises. The focusing diopters are perfectly suited for fine-tuning focus for each eye and they do not rotate the eyepiece. The optical quality is exquisite, to say the least, and we even were able to reduce the overall weight compared to the older Denk II and Standard binoviewers which were made from microscope heads, albeit very good ones. 8. It seems most amateur astronomers are taking up imaging in some form or other. Why should stargazers bother with visual observing anymore? In my early days of using the Meade 10" LX3 SCT, I tried my hand at astrophotography. I remember seeing images by Tony Hallas and others with their apo refractors. Donald Parker's amazing planet images caught my attention also. I still remember seeing an image of the California Nebula by John Gleason and wishing I could achieve a similar level of expertise, and perhaps get my images published in the magazines. So I learned film developing, I bought hypered Tech Pan 2415 film, and I learned to hand-guide my scope by watching a star in a crosshair of an eyepiece. I went out all night if the skies were clear and moonless, every chance I got. After taking images and developing the negatives in my bathroom darkroom, and then printing the images, I was not only exhausted but I was also very unhappy with the results. What's worse, I realized I had virtually stopped looking at the night sky! I had lost sight of what had driven me to do astronomy in the first place. Here I was trying to record images in order to perhaps get published. But astronomy was never supposed to be about me. Originally, the goal was to lose any preoccupation with myself and my everyday goings on by viewing the vastness of the Universe. I had clearly drifted away from that by concentrating on capturing something rather than just experiencing the wonders in real time. I am now a strictly visual observer. For me, moving in close and peering through the eyepieces at an object in space is about having a mind-expanding experience. Being around a telescope with both experienced observers and newcomers and listening to the comments as each person views a particular object is what it was always about. The lure of the internet and immediate display of heavily-processed images seems irresistible to a large number of amateur astronomers. But frankly, it saddens me when I attend star parties and more than 50% of the field is comprised of people imaging and not viewing. I have been attending star parties for 30 years and this is what I see now. I'm not sure it's linked to imaging, but I have personally seen the reduction in the number of attendees at star parties and a major trade show I have attended for 16 years. I have spoken with many observers who agree with me about the disappearance of young people coming into the hobby. Converting the act of looking through a telescope at the night sky and its wonders to taking pictures is not helping matters. That's my opinion. Fig. 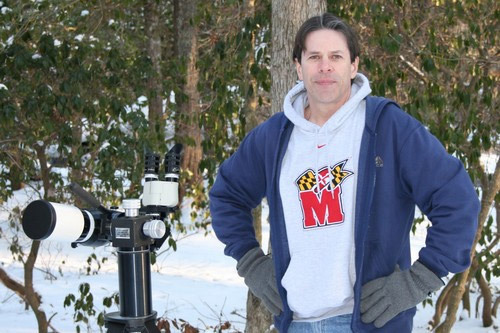 4 - Russ Lederman at his telescope with Binotron binoviewers and the 3D Astronomy L-O-A eyepieces. 9. 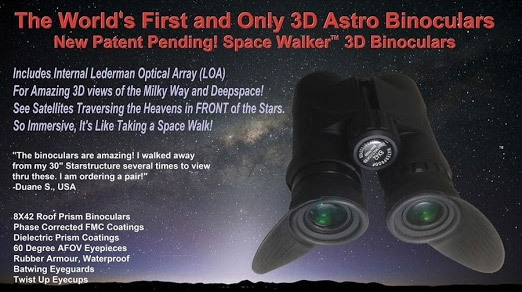 How did you get the idea for your L-O-A 3D eyepieces and your 3D SpaceWalker binoculars? As a child, I was a big fan of 3D comics. I remember seeing really cool pictures of one super hero or another coming off the page. The images were made by creating the illusion of parallax by placing very close side-by-side images of the figure in both red and blue ink. Since each color showed a slightly different perspective of the subject from a slightly different angle, and by wearing glasses that restricted the red image to one eye and the blue image to the other eye, the perception of depth was created. I was amazed by this and it allowed me to understand how we all were experiencing our world with depth perception in everyday life. I began making my own simple drawings using blue and red ink and wearing the cardboard 3D glasses that came with the comic. I never forgot those 3D images that transfixed me in my early years. I was also a fan of the View-Master! With the View-Master, the same principle was at work. Using two side-by-side lenses, a double positive slide was produced. If each member of the slide pair was viewed simultaneously with the View-Master device, very realistic depth perception would result. In binoviewers, even when using two eyes, no depth perception is possible. While many observers comment on a subtle "3D effect" on a few objects with binoviewers, it's clear that there is no real depth perception. True depth perception only works out to a distance of several feet, and astronomical objects are just too far away. The discernment of depth with distant objects is more of a 'mental calculation' and is not a true effect of depth perception. At Denkmeier Optical, the very first centerplate logo I designed was a side-by-side 3D image. If you look at the picture of this logo center plate, which was part of the very first binoviewers that we shipped, you will see two black circles, each containing images of a galaxy and stars. I offset some stars in one circle so that if you slightly defocus and cross your eyes, you can see a third image in dead center. This is another simple illustration of depth perception. I never thought it would be possible for me to develop a system that could actually produce 3D views of the heavens. But I am stubborn and persistent. I would periodically think of something that might work, try it, and fail. My attempts involved using neutral density filters to block some stars, offsetting eyepiece holders horizontally, and some other far-fetched ideas, Sometimes not being willing to give up is a good thing, while others times, not so much! However in this case, I could not let the hope of achieving 3D at the telescope go. 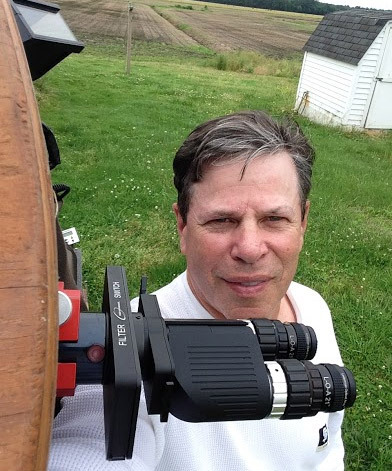 It was not until 2014 that I had a "eureka moment" and realized that I could likely accomplish my quest for producing spectacular 3D views of deep-sky objects through binoviewers, giant binoculars, and even regular hand held binoculars using an array of optical elements at the eyepiece. But would building my proposed optical array and placing it in the light path allow for clean and natural 3D views of the heavens? 10. How long did it take to develop them and get them to work well? Since there was really no precedent to study (a professional patent law firm found no applicable prior art), I had to have my optical people follow my initial designs based on my general study of displacement techniques, the same techniques that optometrists used to cure diplopia (double vision). However, compared to optometry, it is a very different undertaking where telescopes, eyepieces and high magnifications are concerned. I mainly did all of the early work in my optical lab viewing a reticle with a binoviewer. I experimented with optics that accomplished displacement to various degrees, and I learned a lot by observing the effects that the glass elements in the array produced. Each time I adjusted the shape, thickness, and displacing powers of the components, it took three months before we could complete the test optics. 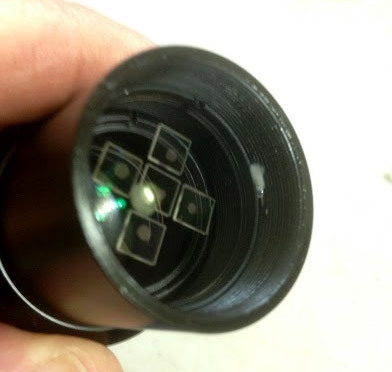 After experimenting with existing eyepieces, I came to the conclusion that the only way I could perfect a 3D system for telescopes with binoviewers would be to build new eyepieces from scratch that would work perfectly with the 3D L-O-A (the patent-pending Lederman Optical Array). 11. So you had to design new eyepieces to work with the array? Yes. This is because the array does not have fixed image displacement. The displacement powers change depending on the location of the array with respect to the eyepiece focal plane. In fact, even in the perfect position, some doubling of bright stars may occur if such stars fall on the border between an array panel and the unit field (which are the field areas where no array panels are found). The doubling occurs only when the border of the panel with highest displacement has a star situated there. The only way to eliminate this was to reduce the power of that panel. However, this reduced the 3D effect quite noticeably. The answer was to approach the 3D system as an interactive experience. By this, I mean that when using L-O-A 3D eyepieces, the observer should move the object around the field of view. Then the perspective will appear to change radically! We all are used to viewing everything on axis, so this requires a slight change in observing. But the effect is remarkable. When using the L-O-A and viewing in 3D, it is amazing how the entire field is transformed as the target is moved to various areas. Therefore, if you encounter a doubling of a star when it falls exactly on the edge of the most powerful panels, you simply nudge the telescope to move the star off that edge. It is an interactive system, and moving the object around is part of the process. The "Near" and "Far" feature of L-O-A eyepiece serves to illustrate just how amazing the brain is. Through my early work, I noticed that changing the direction of the horizontal displacement produces a juxtaposition of distances instantly! Just rotate the eyepiece with the L-O-A by 180 degrees and the nearest object becomes the most distant object. This is especially valuable when viewing galaxies. Examine the galaxy up close in the foreground by using the "N" setting. I do feel that more detail can be seen this way. Now rotate the eyepiece to the "F" position and a different view of the galaxy is produced. It is seen far in the distance while most of the stars throughout the field of view are all closer in varying degrees. I was eventually able to produce a 3D system that worked ideally and passed stringent tests under the night sky. It was a long multi-year process and I even ended up in the hospital for three days with pneumonia in February of 2015 after working outdoors in 12 oF temperatures while recovering from the flu. 12. What's the principle of operation behind the L-O-A eyepieces and the SpaceWalker binoculars? While I will not reveal all the specific details, I can say that the array is located in only one of the two eyepieces in the L-O-A set. To use the L-O-A eyepiece set, a binoviewer is required in a telescope. The array also works in giant binoculars. I have also designed an array integrated into hand-held binoculars. But all of the 3D effect can be accomplished with the array in only one eyepiece. In the case of L-O-A, through the principle of binocular fusion, the merging of two images with slightly different characteristics results in a single image where depth perception has been introduced. In fact, the 3D effect produced by L-O-A is achieved by the identical process that normal depth perception is produced. One eye is seeing some (but not all!) objects horizontally shifted within the field of view. The shifts are both left and right, to greater and lesser degrees, compared to areas not affected by the array 3D panels. It can be hard to predict whether the final 3D image produced by the L-O-A will be satisfying and apparent enough, or too apparent! If too great, diplopia (double vision) will be the result. This is why experimentation under the sky with various instruments such as refractors, Newtonians, and SCTs was so important during the development stage. Hand-held binoculars with the LOA array proved to be quite different and required some adjustments to my optical formulas and array panel size. Fig. 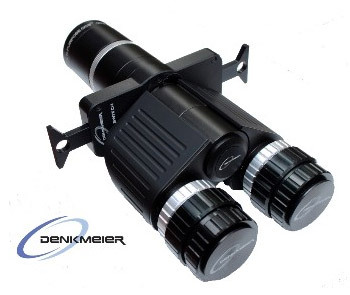 6 - The 3D Astronomy SpaceWalker 8x42 binoculars incorporate the Lederman Optical Array technology. 13. Of course getting the array to work was one thing. Then you have to build them in production quantities. Was this a challenge? Definitely! Developing the ideal technique to build the array was difficult. While the process is proprietary, let's just say it took many sleepless nights to figure out how to produce an array that resulted in the elimination of aberrations. Through observation and experimentation, I noticed that I could eliminate the appearance of the array panels in the field of view when the array was used under a fairly dark sky. So the L-O-A works best in skies where the naked-eye limiting magnitude exceeds 4.0 to 4.5. Remember that L-O-A is primarily a deep-sky observing device, and as with any deep-sky observing program, the darker the skies, the better the view! In any case, by developing and implementing the proper technique when building the arrays, I was able to make the array panels disappear under at reasonably dark-sky conditions so that only their effect, rather than the panels themselves, could be seen. 14. What are the advantages of '3D' visual observing over regular bino-viewing? Firstly, it has been shown that steroacuity, the ability to perceive depth, improves over time, often several fold*. I suspect an increase in detection of resolution occurs as well. My experience when viewing faint objects like IC1296, the faint galaxy near the Ring Nebula, is that using the "N" position in the L-O-A array and moving the galaxy forward and apart from the general background of the field renders it easier to detect. Interestingly, as we use depth perception under normal situations, the object that we are looking at is in sharp focus. The background may be out of focus. This is similar to using a portrait lens with a very narrow depth of field. The subject is in sharp focus while everything else in the image is "fuzzed out". This serves to accentuate the importance of the subject. However, when using the L-O-A, various areas of the field, whether seen as closest, furthest, or somewhere in between, are all in sharp focus! This effect is counter intuitive because the depth of field is infinite. So an object perceived as very close to the observer and another that appears far in the distance are both in sharp focus. But it's not hard to get used to. 3D astronomy in real-time visual observing allows you to see the Universe in a way that much more closely approximates reality. Because all celestial objects are located at great distances, well past the point where there is any hope of seeing them with depth perception, we are forever limited to viewing a flat equidistant night sky. With the L-O-A, we can now see things the way our eyes and brain evolved to work, and objects appear, in a way, to be more realistic and vivid. * Fendick M, Westheimer G. (1983), "Effects of practice and the separation of test targets on foveal and peripheral stereoacuity", Vision Research, 23, 145-150. 15. Of course the 3D perspective is not related to the true distance of the objects, correct? Some have criticized the 3D views for not being scientifically accurate. Could I build an array that would show one particular field where stars that we know are closer than others actually look closer? Certainly I could do this given a true field as viewed with a particular scope and eyepiece pair. But what would be the point? I have shown that the L-O-A allows a galaxy to be placed deeply into the distance while foreground stars in the Milky Way appear closer. But just how is a galaxy that is 30 million light years away supposed to look in relation to stars in our own galaxy? Would it look any different if it were just 25 million light years away? The point is that when a novice looks through a single eyepiece, or a binoviewer without the L-O-A and asks "what is that smudge in the center? ", you must explain that the glowing little cloud is actually a galaxy that is millions of light years away from the hundreds of foreground stars in the field of view. With the L-O-A, this can be perceived immediately, and the sight is beautiful and wondrous and reflects a useful perception of the amazing reality of our Universe. Binoviewer aficionados often comment that one or another object (usually the Moon or planets) have a 3D appearance when observed with both eyes. This is always considered a big plus. While the L-O-A is not conducive for viewing the Moon because it is so bright and the surface would appear as a mosaic, visually all deep-sky objects undergo a major transformation and the 3D effect is anything but subtle. There is no mistaking the intense depth perception that occurs. Most L-O-A owners who have had ample experience using binoviewers with conventional eyepieces are thrilled with the new and transformative 3D views produced by the Lederman Optical Array. 16. What's the best telescope and binoviewer set-up for 3D observing with the L-O-A eyepieces? All telescopes work well! I tested my 3D system using a 20" f/5 Dob, a 14" f/4.5 Dob, an 80mm f/7 apo refractor, a 6" f/5 achromatic refractor, an 11" SCT, and 102mm giant achromatic binoculars. The wonderful thing was that the 3D effect remained as intense in every instrument. Wider fields in the smaller instruments yielded more stars and very pronounced 3D effects. Larger instruments brought single deep-sky objects into the realm of 3D with amazing added detail. The hand-held 8X42 Space Walker Binoculars, which are designed with the L-O-A integrated into their eyepieces, gave super-wide low power views of the sky. Satellites could be seen as foreground objects traversing the starry background, all from the comfort of a lawn chair. So all scopes work fantastically in their own way. And while the Denkmeier Binotron-27 binoviewer is a world class instrument, the L-O-A works in other binoviewer brands as well. I offer a very nice discount if a Binotron is ordered at the same time as the L-O-A eyepiece pair. 17. What are your favorite deep-sky objects to view with 3D eyepieces? The Lagoon Nebula (M8) is incredible in my 20" Dobsonian. The emission nebula and the dark nebula in the Lagoon appear in 3D along with the associated stars. The Swan Nebula (M17) is mind blowing. So is the Ring Nebula (M57). I remember an awesome view of NGC 891 (an edge-on spiral galaxy in Andromeda) through Rob Teeter's 20" f/3.75 Dob. We moved it to the "far" position and it appeared hauntingly in the deep background of the starry field, with the dark lane apparent under the black summer skies at the Rockland Star Party in the Berkshire Mountains. It is hard to say what my favorite objects are because all classes of deep-sky objects look so fantastic in 3D. Planetaries, globulars, open clusters, emission nebulae, and even well-populated star fields without designations all look stunning. 18. Can you share some feedback from early users of the eyepieces about their observing experience? "Unbelievable!" "Amazing!" "OMG!" "This is INCREDIBLE!". I suggest that readers look at the videos (many are necessarily dark) at www.3dastronomy.com. The comments can be heard on the videos for sure. 19. What other 3D Astronomy products are you working on? I am working on a 3D 30mm Plossl pair with fewer 3D panels that offer four levels of depth and 50o apparent field of view. I am hoping to offer those to observers who have basic binoviewers and who would like a 3D deep-sky experience but cannot afford the price of the exceptional widefield L-O-A 21mm 3D Eyepieces, which have six levels of depth and 65o apparent field of view. The Space Walker 8X42 3D roof prism binoculars will begin shipping to the first customers sometime in late June 2016. I do have some other projects I am exploring but I do need the support of the community! The used market is particularly devastating to this small niche industry. As always, I depend on the loyal support of customers. 20. Thanks for joining me for this profile. I think many readers have learned a lot! This article is © AstronomyConnect 2016. All rights reserved. Images © Russ Lederman 2016. All rights reserved.